Coating is a finishing process used prolifically throughout industries working with agglomerates to meet a wide variety of objectives. A surface treatment for particles, coating can be used to enhance specific characteristics of a pellet, granule, or other agglomerate, be it a mineral, chemical, or otherwise. Coatings are frequently applied in order to maintain product integrity, mitigate issues such as dust and/or attrition, or even to improve product performance. This article will cover the benefits of coating, how the coating process works, and factors to consider in selecting the proper coating for your application. Coatings can offer a variety of benefits depending on the material and application. The diverse market of available coatings has created an opportunity to meet a variety of goals concerning the performance and handling of agglomerates. Some of the most common reasons for coating a material are listed below. Dust is not only a nuisance, but depending on the material, may be hazardous as an air pollutant. Additionally, the creation of dust and fines can affect the bottom line; dust can become windblown in some applications, yielding unpredictable and undesirable results, and often resulting in product loss. For these reasons, the control of dust is one of the most common reasons why agglomerates are coated. Dust is an especially common issue with granules that were created via roll compaction, due to the jagged edges of the granules that can break down into fines (a phenomenon referred to as attrition). Coatings can be used to reduce the opportunity for the creation of dust and fines by creating a barrier on the exterior of the granules that helps to prevent product breakdown. A common example of this can be seen in the fertilizer industry, where granules and pellets are often coated with anti-dusting agents to mitigate issues associated with dust. This ultimately improves handling and transportation, as well as application. Similarly, products that are “soft” can benefit from coating; coating can prevent the breakdown of product during transportation. The undesirable clumping of particles, referred to as caking, is often a challenge when working with bulk materials and also accounts for one of the primary reasons for which agglomerates are coated. Caking often occurs during transportation and storage, or while on product shelves and can occur with many types of materials. Anti-caking agents can be used as a coating on granules to prevent crystalline structures from forming between agglomerates, ultimately reducing caking and maintaining the integrity of the product. Similarly, various oils, waxes, clays, polymers, latexes, and more can all be used to prevent moisture absorption. This is commonly seen in fertilizers such as urea, KCl, ammonium sulfate, and more, which become very soft and have the potential to cause caking if they absorb moisture. 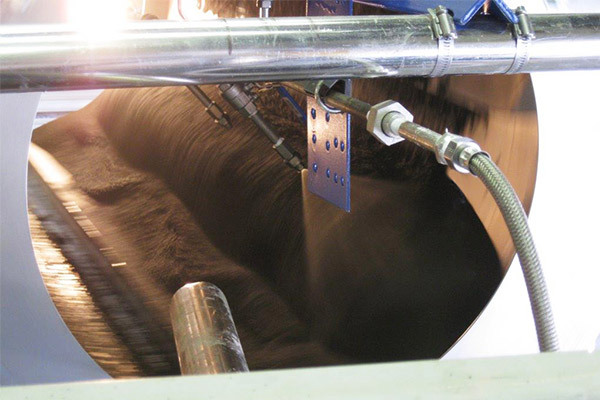 The flowability of a product can sometimes be a challenge when working with bulk materials. Flowability refers to the flow and handling properties of a material in bulk. This affects how material will move through a processing facility, including discharge from rail cars, moving from one conveyor to another, from a hopper to process equipment, and more. As a surface treatment, coatings can help to improve the flow properties of a material by adjusting the surface characteristics. Granules with a rougher surface quality will have a higher angle of repose (the angle at which a material can be piled before it begins to slide against itself). A high angle of repose can cause issues in terms of flowability. Conversely, a material with a smooth surface quality will have a lower angle of repose, meaning that it will slip against itself at a lower angle. This helps to ensure that granules move more freely through bins and hoppers and between transfer points and the like. Various coating types can be used to improve the surface characteristics of a granule, ultimately improving the flowability and handling qualities of the material. Coating is also frequently used for aesthetic purposes; a coating can lend a smooth, shiny surface to otherwise dull granules. 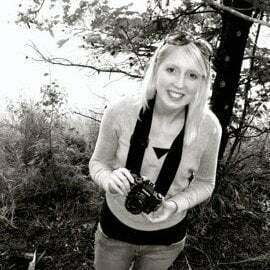 This can take a product from average to premium, increasing the marketability of a product. Coatings can also be used to color particles. This is frequently seen in the roofing industry, where granules are coated in a variety of pigments to create specific colors for use on asphalt shingles. Coatings can also be used to influence the way a product performs. A coating can affect the solubility of a product, or be used to control the release properties, such as in the fertilizer industry. Coatings can also be used to add another ingredient to the product formulation. For example, cat litters are frequently coated with a clay material to promote the clumping action cat owners desire. In other cases, “coatings” are used as the carrier themselves in order to improve product performance. This is seen in the fertilizer industry where clay pellets are coated with materials such as herbicides, pesticides, or fungicides. The clay pellets are highly absorbent and can effectively absorb the applied materials. 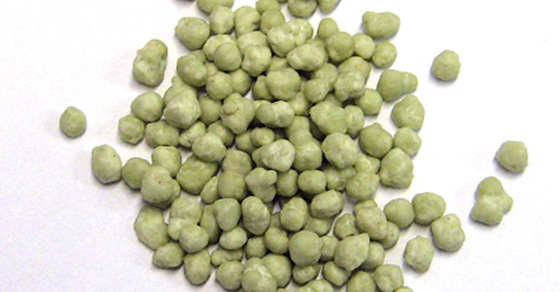 The resulting pellets are similar in size and weight to fertilizers, allowing them to be spread easily with the same equipment. As has been shown, coatings can be used to ensure product integrity is maintained in a way that allows granules to arrive at their end use in the form in which they were intended. Maintaining the integrity of some products may also serve as a safety measurement. For example, coal dust and sulfur pellets can be a risk of explosion; coatings can be used to reduce this dangerous potential. There are many types of coatings available, from mineral oils, clays, and waxes, to polymers, latexes, and silicas, and just about everything in between. In some cases, multiple coatings, or a combination of coatings, may be required to achieve the desired results. In selecting a coating(s) for a particular application, many factors need to be taken into consideration. Some of the most critical factors to consider in coating selection are explained here. Much like binder selection, the industry and/or end use of a product may dictate which coating(s) would be most appropriate. For example, coatings that may pose toxicity risks to soil would not be an appropriate coating for a fertilizer product, while a vegetable derivative would provide an effective coating and could also possibly add value to the product. As with any other project considerations, cost is often a major factor in coating selection. Some coatings may offer a high performance solution, but be too costly to be practical. This is especially a concern in industries where margins are already slim. Ease of application is also an important consideration. Some materials are easily applied and distributed throughout a bed of material (such as oils, waxes, some polymers, and latexes). The contact action of rolling and tumbling between the pellets aids in transferring the coating uniformly across all the pellets. Conversely, other coatings might be good in theory, but are challenging and costly to apply. This is often the case with materials such as hot melts, dyes, and acids, because the material does not readily spread on contact. These difficult coating materials may require a specially designed spraying system to assure uniform coating distribution. Coating is typically carried out using a pug mill (paddle mixer) or coating drum, with the latter being the most common. In each case, the equipment should be designed to promote a uniform coating of particles. Variables such as spray location, flow rate, nozzle type, and more can all be tailored to achieve optimal results. 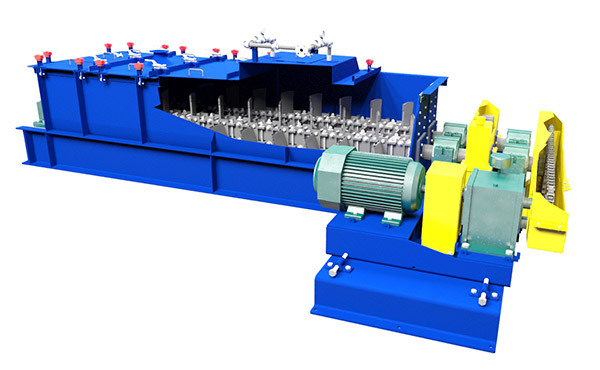 Pug mills utilize a kneading and folding over motion that promotes a homogeneous mixture of liquid and solid feed. When a pug mill is utilized, the process may sometimes be referred to as conditioning. Granules are fed into the inlet of the pug mill and a spray nozzle system tailored to the coating sprays the coating over the material. The mixing action thoroughly coats the product. Coating drums are similar to agglomeration drums; a rotating drum imparts a tumbling action on the bed of granules. As the drum rotates, a spray system affixed to the interior of the drum sprays the tumbling bed with the desired coating material. Pug Mill or Coating Drum? The choice between which type of equipment will suit the needs of a particular project is a commonly faced choice. While testing is integral to determining the best approach, other factors come into play as well. With both types of equipment, two factors are especially important in achieving optimal results: the spray system and the movement of the pellets. A good spray system is needed to effectively and uniformly distribute the coating across the bed of material. Choosing the right spray system is particularly important when working with a challenging coating, such as a hot melt. The bed action is also important; the bed of pellets needs to move in a way that maximizes exposure of the pellets to the coating to enable all pellets and all sides of the pellets to be evenly coated. The action of the bed and the spray system chosen will need to work seamlessly together to obtain the desired results. Image: This image from a coating test conducted in the FEECO Innovation Center shows the spray system and tumbling bed in a coating drum. Coatings are typically applied in a very thin layer and often do not require an additional drying step. However, some coatings may require a “curing” step, in which the coated agglomerates are processed in a rotary kiln to essentially bake on the coating. This is seen in the roofing industry where granules are coated with a coloring agent and then fired in a rotary kiln to produce the end product. Because there are so many variables (base material, coating type, equipment and process variables), it is often desirable to test coatings to determine which type will offer the best results, both in terms of processing and performance, as well as the process and equipment variables needed to produce the desired results. Coating is a valuable opportunity to maintain product integrity, improve product handling and performance, and even enhance appearance when working with agglomerates. There are many factors to consider in selecting a proper coating, as well as what type of equipment should be used to apply the coating. As an industry ripe with variability, testing is often a critical component to achieving the desired results. 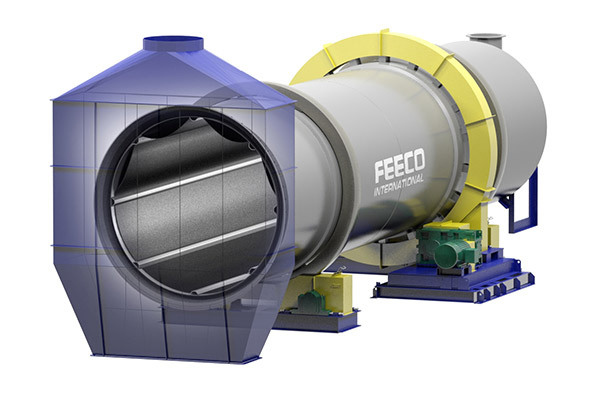 FEECO has been an expert in agglomeration since 1951. We’ve helped solve hundreds of material problems, and turn ideas into marketable products through our unique testing facility, our expertise in process design and development, as well as our custom agglomeration equipment. We can help you to test your material to evaluate various coatings and process parameters, and then manufacture the equipment needed. For more information, contact us today!